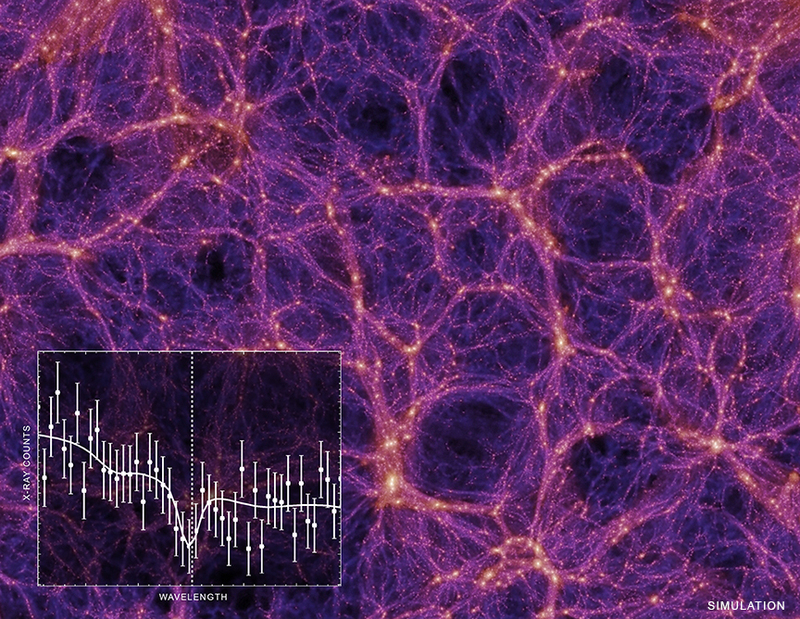 The Universe's "missing mass" may have been found, according to a new study using Chandra data. About a third of the "normal" matter (ie, hydrogen, helium, and other elements) created shortly after the Big Bang is not seen in the present-day Universe. One idea is that this missing mass is today in filaments of warm and hot gas known as the WHIM. Researchers suggest evidence for the WHIM is seen in absorption features in X-rays collected from a quasar billions of light years away. If these filaments exist, they could absorb certain types of light such as X-rays that pass through them. The inset in this graphic represents some of the X-ray data collected by Chandra from a distant, rapidly-growing supermassive black hole known as a quasar. The plot is a spectrum — the amount of X-rays over a range of wavelengths — from a new study of the quasar H1821+643 that is located about 3.4 billion light years from Earth. The latest result uses a new technique that both hones the search for the WHIM carefully and boosts the relatively weak absorption signature by combining different parts of the spectrum to find a valid signal. With this technique, researchers identified 17 possible filaments lying between the quasar and Earth, and obtained their distances. For each filament the spectrum was shifted in wavelength to remove the effects of cosmic expansion, and then the spectra of all the filaments were added together so that the resulting spectrum has a much stronger signal from absorption by the WHIM than in the individual spectra. Indeed, the team did not find absorption in the individual spectra. But by adding them together, they turned a 5.5-day-long observation into the equivalent of almost 100 days' worth (about 8 million seconds) of data. This revealed an absorption line from oxygen expected to be present in a gas with a temperature of about one million Kelvin. By extrapolating from these observations of oxygen to the full set of elements, and from the observed region to the local Universe, the researchers report they can account for the complete amount of missing matter. A paper describing these results was published in The Astrophysical Journal on February 13, 2019, and is available online at https://arxiv.org/abs/1812.04625. The authors of the paper are Orsolya Kovács, Akos Bogdan, Randall Smith, Ralph Kraft, and William Forman all from the Center for Astrophysics | Harvard & Smithsonian in Cambridge, Mass. Credit Illustration: Springel et al. (2005); Spectrum: NASA/CXC/CfA/Kovács et al. A quasar and gigantic filaments of warm and hot gas in intergalactic space. The quasar is about 3.4 billion light years from Earth. The main part of this graphic is from the Millenium simulation. 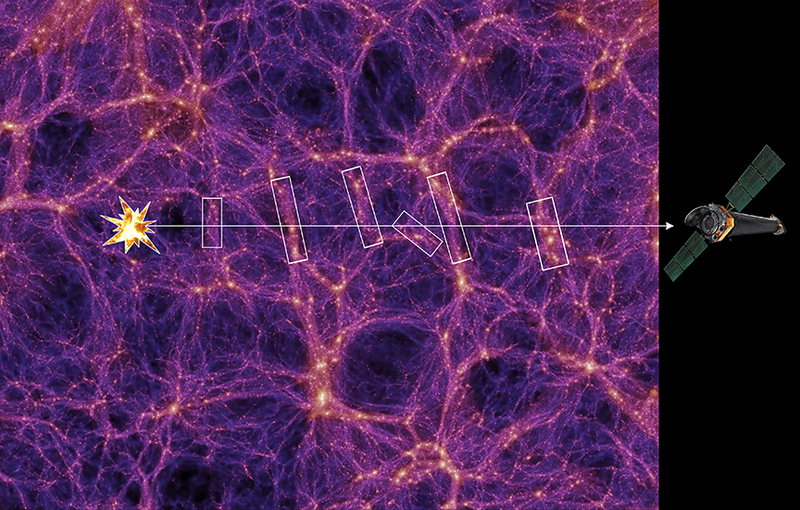 Tour of Where is the Universe Hiding its Missing Mass?